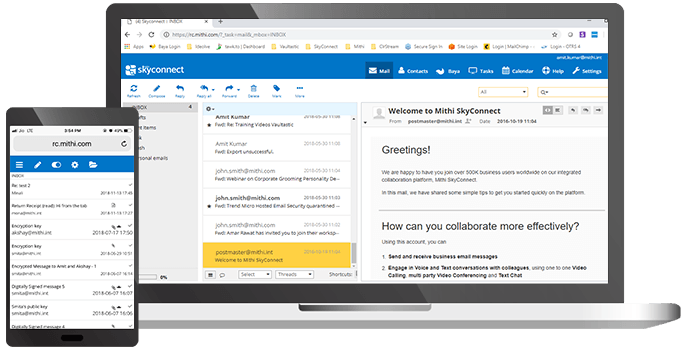 Baya 3 is a modern and responsive web client platform, which is used to access the SkyConnect suite of productivity applications. We listened to you and engineered Baya 3 to be a major upgrade over Baya 2. 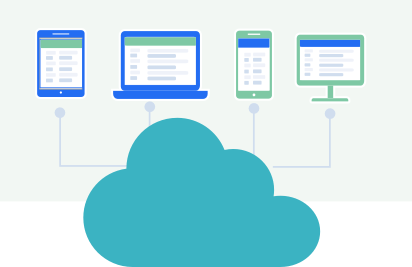 Baya 3 is designed from ground up to enable your users to have seamless and uniform access to their mailbox account from multiple devices, with zero installation or configuration of any application on the end points. Baya 3 retains and builds on the security framework of Baya 2 to improve the security coverage against modern day threats such as hack attempts, impersonation, spoofing, data theft, and adds capabilities such as PGP for closed group encrypted communication, multi factor authentication, and more. 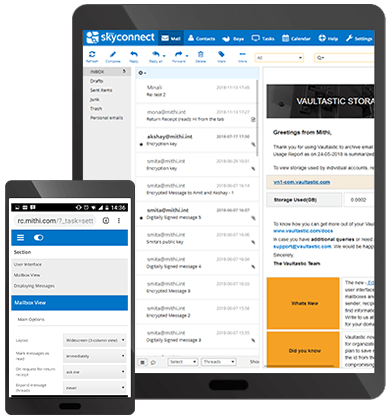 Baya 3 is responsive to multiple form factors, provides an integrated front end to all the productivity applications on SkyConnect. Baya 3 allows easy extension of functionality using APIs and out of the box plugins, thereby reducing TAT on new requirements, and putting you back in the drivers seat for quickly customizing the app for your specific needs. 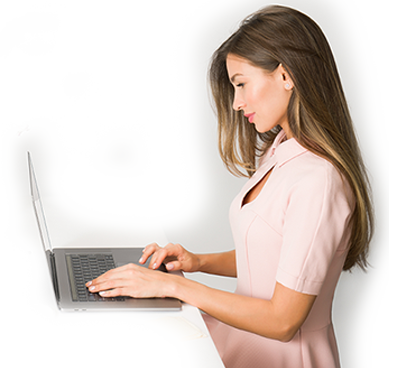 Baya 3 is a simple and powerful workhorse which comes with advanced features to give you full control over your communication desk – message drafts, A.I. 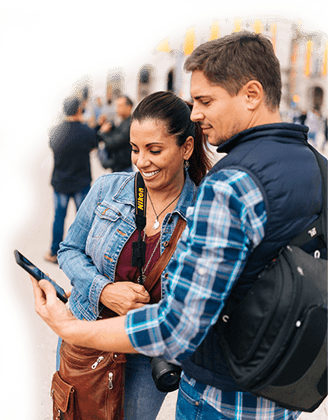 based message insights, follow-up reminders, one to one encrypted secure communication, convert emails to tasks for deeper action. To name but a few. Most of todays digital and mobile workforce improve efficiencies by accessing their productivity applications from multiple devices depending on whether they are at home, office or on the move. Since Baya 3 Is OS platform and browser agnostic, your users can sign in from virtually any device using any of the popular browsers to access their mail account and get an upto date view on any of their devices. Users get a wider choice of access device options and can get started instantly with no need to install or configure any software or application on their endpoints. Baya 3 is an online application and runs within the browser to access the user’s account over a secure Internet channel. There is no local storage of any data on the end point device. This means that all your organisation data, in the mail accounts of your employees, stays on the cloud and is simply consumed via a web front end. This gives you peace of mind that it won’t matter if the end point is lost or damaged. Simply provide a replacement, and start using the apps again. Baya 3 is built ground up directly for the modern web user and uses cutting edge user interface paradigms to bring a desktop like feel to the productivity apps on SkyConnect. Collapsible panes allow you to shift from an overview to a more detailed drill down view of the information enabling the user interface to follow your context. 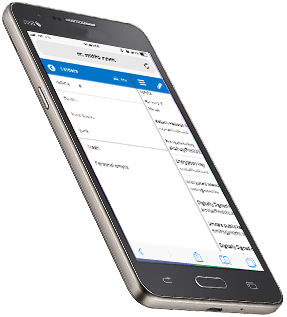 Switching between folders and mails is now a thing of the past. 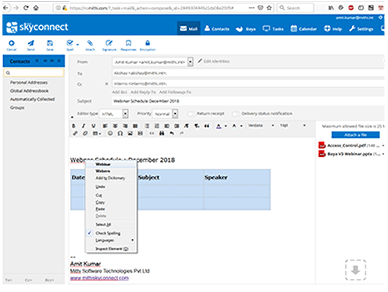 Features such as conversation thread views, drag drop, context sensitive menus, super-fast search across folder, and keyboard shortcuts for most frequently used actions, to help you get things done faster. Baya 3 automatically watches your email conversations to build out a personal list of frequently used contacts, which are used in auto suggestions to improve efficiencies. To maintain regular contact with teams and groups, you can make personal groups (broadcast lists) comprising members from your domain and external people. This saves you the time while composing and sending emails to these groups. Baya 3 also provides tools to support the popular vcard format and allow your users to import contacts in bulk and export contacts to support data migration to and from other clients. Reduce typo, improve the quality and confidence of your communication with the built-in spelling checker and add-on tools like Grammarly for grammar checking etc. Baya 3 comes with a rich message compose area supporting the insertion of multiple media objects such as images, videos, tables, hyperlinks and more, text formatting options and toe. Foldable panes and full window compose options provide you with a clutter free expansive message area to facilitate an-distracted writing. The modern-day work is driven by schedules and depends heavily on the calendar to keep track of engagements and events. Baya 3 sports an all new collaborative calendar, to help you share and integrate your schedules with people anywhere using any of your devices. Most organisations publish multiple calendars such as the annual holiday calendar, the annual activity calendar, the sales calendar and more. These are all in addition to the user’s calendar. 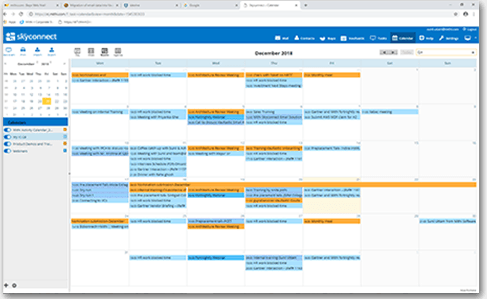 An on/off switch for each calendar allows you to move from a full overlapped view of all events to a simple decluttered view depending on your current need. Your next marketing webinar is a big one with multiple tasks that need to be carried out prior to the event. But it is getting difficult to keep track of all the to do’s and due dates and your hustle is slowly starting to wane. 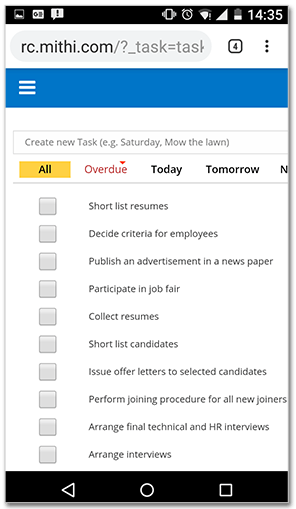 With Baya 3, you can now create task lists with sub tasks, due dates, status etc, classify them with tags to group related tasks and track each task to completion. What’s more, if you receive an email needing a planned action from your end, you can convert an email to a task, break it down into sub tasks to help in planning and follow through to completion. Baya 3 exposes APIs and web services allowing you to integrate the platform with your business systems to deliver on specific composite use cases with ease. E.q. updating signatures of all employees from a central place. Baya 3 was designed to de-bottleneck the speed of extending the platform with new capability. A plugin framework allows you choose from a wide variety of ready to use extensions and to also develop your extensions using a standard framework and simply hook it into the platform. Get back into the driver’s seat. Copyright © 2019 Mithi Software Technologies Pvt Ltd, the makers of SkyConnect. All rights reserved.